John Gotti made his way through the ranks of the Gambino crime family by killing, eventually wiping out a rival to take over as the boss. (CNN) -- By murdering his way to the top of one of the nation's most powerful mob families, John Gotti became an urban legend, respected and feared by many. He was the last of the classic gangsters, a Mafia chief who broke all the rules, reveled in the public spotlight and, at least for a while, seemed untouchable with his multimillion dollar illegal operation that thrived on prostitution, extortion, gambling, theft and drugs. He died at age 61. "He was a thug in a great-looking suit," said Juliette Pappa, a reporter for WINS radio in New York who covered Gotti in court. "And there is that wonderful chemistry about that." Gotti's larger-than-life appeal sprang from a contradictory mix of violent outbursts and an uncanny ability to win the admiration of his Queens neighborhood, where he was known for organizing picnics and giving handouts. "I think he's good for 101st Avenue," a woman told TIME magazine in 1986 when Gotti frequented the area. "There's no riffraff around here. If it weren't for him, this neighborhood would be carried away by the drug addicts." The New York tabloids nicknamed him "Dapper Don," for his $1,800 tailor-made suits and the air of importance he exuded as walked down 101st Avenue to the Bergin Hunt and Fish Social Club, headquarters for the Gambino crime family. Gotti's attorney, Bruce Cutler, paid homage to his client's unusual style. "He is a most remarkable man, one of the most remarkable men I've met," Cutler said in an interview before Gotti's death. "If you just think of the name John Gotti and what it conjures up, you see a person who has affected the world. He, in a certain sense, changed the world." Gotti gloried in the attention of the press, which dubbed him "Dapper Don" for his expensive taste in suits. To his daughter, novelist Victoria Gotti, her father was a commanding figure, who was just like any other dad. "We had to remain a close-knit family," she said. "And I think that growing up that my dad executed the values and the morals that he wanted us to take through life." Gotti achieved fame and notoriety at a great cost. Retired FBI agent J. Bruce Mouw, who helped convict the famed mobster, once said, "John Gotti is a stone-cold killer. He is responsible for the deaths of scores of individuals. He's a very vicious and ruthless boss." Gotti was born October 27, 1940, in the Bronx, New York, into a large blue-collar family. His father, Joseph, was a sanitation worker. By the 1950s, the Gotti family, which had little money, moved to a Brooklyn neighborhood called East New York. There, young Gotti took to the streets after dropping out of school in the eighth grade. "This is one of 11 children who had nothing in life as far as money and opportunity," Cutler said. "But he made his opportunities. Nobody gave him anything." The future Mafia boss' first encounter with crime was not a success. At 14, Gotti, a street gang member, tried to steal a cement mixer. The plan failed when the mixer overturned and smashed his big toe. The fast-talking Gotti told police it was just a boyhood prank. Over the next few years, Gotti was arrested five times on various charges. In 1966, he made the fateful move to Ozone Park in Queens, New York. There, he hooked up with the powerful Gambino crime family, headed by Mafia godfather Carlo Gambino. Gotti quickly graduated from small-time heists to big-time felonies. At the time, his turf was the John F. Kennedy International Airport, where he later hijacked freight to earn money for the Gambinos. In 1973, he earned his Mafia bona fides by taking on the assignment to kill James McBratney, a member of an Irish-American gang suspected of kidnapping and killing Gambino's nephew. "He had led a charmed life, even when he committed a murder earlier in his career -- which was a springboard to his success," said Selwin Raab, a former reporter for The New York Times who covered organized crime. "Carlo Gambino, who was then head of the crime family in the '70s, got him a very smart lawyer, Roy Cohn. And, somehow, he managed to get a murder in which there were two eyewitnesses reduced to second-degree manslaughter." By the time Gotti finished serving a two-year prison sentence for the McBratney slaying, Carlo Gambino had died. Paul Castellano, Gambino's cousin, was anointed head of the family. At the time, Gotti was a rising star within the family, and unbeknownst to Castellano, he was also a potentially deadly rival. Castellano had a following among the older Gambino members, but Gotti's brash style appealed more to the younger generation -- a group unlike Castellano's who saw big bucks in the heroin trade. Mouw, the retired FBI agent, described the tension between the two groups in the family. 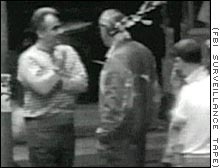 "In 1985, there was a serious dispute between the Gotti faction of the family and the boss, Paul Castellano. And the main issue was that Castellano suspected the Gotti crew of engaging in heroin trafficking." Castellano didn't want to be involved in drug trade for fear there would be too much federal heat against the family, which was making more than enough money controlling discreet businesses such as construction and private sanitation services. "Other members of the family were worried about Castellano losing his marbles," Mouw said. "He had been indicted. They thought he might become a government witness. He had thrown his wife out of his house. ... So, there were a lot of other reasons for this rift. But the big reason was the narcotics issue." It was time for Gotti to make a move. He decided to kill Castellano and assume leadership of the Gambino family. 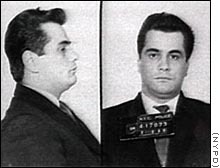 Mafia rules at the time required Gotti to seek approval for the hit from the heads of the other four main Mafia families in New York, collectively know as "the Commission." Despite the rules, Gotti did not ask permission. "He secretly reached out for two other families and had their 'secret support,' but this is very shaky as we all know," Mouw said. "So he didn't get the approval of 'the Commission.' He decided to go ahead and act. He did it, and he was successful." On December 16, 1985, Gotti and a small band of Gambino family co-conspirators waited for Castellano outside the Sparks Steak House in Manhattan. Castellano never made it out of his car before he was pumped with bullets. Within weeks, Gotti, with the consent of the various crew captains, or capos, of the Gambino family, was selected the new godfather. Operating out of the Ravenite Social Club in Manhattan and the Bergen club in Queens, Gotti quickly consolidated his power. "He loved this lifestyle," said Raab, the former Times writer. "He changed overnight ... and he was suddenly wearing hand-tailored silk suits made by Italian tailors ... monogrammed socks ... everything flamboyant, flashy. He really thought he was on top of the world." The New York media couldn't get enough of "Dapper Don." It was a mutual love affair. "He loved the limelight," said Pappa, the radio reporter. "It was a star performance. And the media eats that up. It is something to talk about. It is something to report on, and it was something new for organized crime -- to see someone here in New York that flashy." Jerry Capeci of New York's John Jay College of Criminal Justice, who has written several books about organized crime, recalls Gotti's aura. "I think he loved himself more than the media loved him," Capeci said. "I mean, he certainly flaunted it whenever he could. He always had a smile on his face." His reputation followed him into the courtroom. He emerged unscathed from three criminal cases brought against him starting in 1986. The charges ranged from assault to racketeering. In the end, it was Gotti's propensity for the limelight and public exposure that would bring about his downfall. Gotti's high-profile antics got the better of him when the FBI caught him on tape. "He basically conducted his business on Mulberry Street ... downtown Manhattan ... and invited the FBI to come and take pictures of all the gangsters in his crime family who came to visit from New Jersey, Connecticut, the Bronx, Queens," Capeci said. FBI cameras captured it all, from a surveillance post, blocks away from Gotti's headquarters in Little Italy. Before long, prosecutors were ready to file a new racketeering indictment. "It charges Mr. Gotti with four murders, conspiracy to murder another person, obstruction of justice, loan sharking, illegal gambling and tax evasion," said John Maloney, U.S. attorney who oversaw the prosecution of Gotti, at the time of the indictment in 1990. 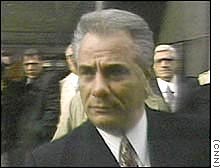 Although Gotti had proved untouchable in past attempts to convict him, this time the government had a secret weapon -- the testimony of Sammy "the Bull" Gravano, second in command in the Gambino family. Sammy "the Bull" Gravano turned on Gotti, testifying and "translating" the mob lingo for the prosecution. 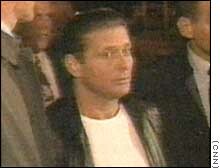 Gravano, a suspected killer, cut a deal with the government, trading his testimony, which would clearly define the Gambino family crime operations, for a lighter sentence. The government also had tapes proving Gotti could be heard ordering mob hits, prosecutors told jurors. "He never used the word 'kill,' but he really damaged himself this time in the last trial because he had Gravano, who would come up there and was in on most of those tapes, and could interpret it and say, 'This is what we really meant,' " Raab said. On April 2, 1992, Gotti was convicted on charges that included five murders. He was sentenced to life without parole. The Gambino family now seemed to be without a leader. In the Mafia, a boss either has to resign or be killed. Despite his prison sentence, Gotti was not about to retire. From jail, Gotti appointed a committee that included his son, John Jr., then 28, to run the Gambino family. Eventually, he named his son the acting boss of the family. And in time, older, more experienced family members began to resent the younger Gotti. "He was just an immature kid who was in over his head in running a major crime family," Mouw said. "He had a tremendous ego, like his father, and didn't know what he was doing and the other families had no respect for him. So he was a very, very ineffective, mediocre boss." From jail, Gotti appointed son John Jr. to run the crime family. 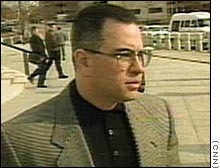 On December 3, 1999, John Gotti Jr. copped a plea to federal racketeering charges, leaving the Gambino family in the care of the senior Gotti's brother, Peter. As Gotti's power faded with his illness from throat cancer, the Gambino crime family became a shadow of its former self. Now with his death, the question remains whether anyone can live up to Gotti's stature in the world of organized crime. "I think the 'Dapper Don' will remain an image of the 20th century. I don't know if there will be one in the 21 century," Pappa said. "I think he was an image that was unique to the time. He was perhaps a throwback to older times that you didn't really see anymore. And he did have star power. His aggressiveness, his looks, his dress, the image that he liked to portray, was definitely out there."